Centre for Economical Demography (CED), Lund University has built up the Scanian Economic-Demographic Database (SEDD) during the last decades. This database contains detailed information about all persons that ever lived in a sample of five parishes in Skåne, from the 17th century until 1968. The SEDD database has been used extensively in international comparative research and there are several PhD thesis based on it. 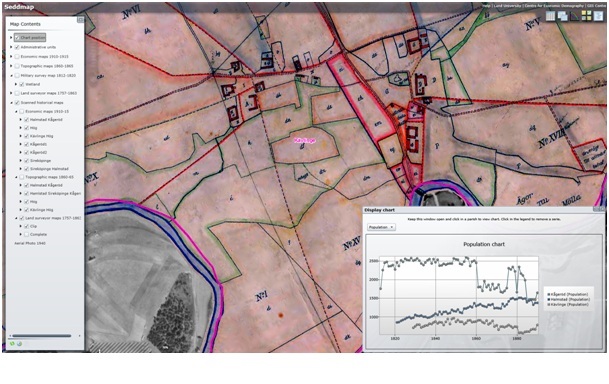 In this eSSENCE project the SEDD database has been linked to both historic and modern geographic information to enhance the analysis of SEDD. By utilizing this connection we know geographic living conditions for the persons stored in SEDD such as: type of soil they cultivated, if the fields where close to a march/forest, topographic conditions, access to roads and railways, settlement density, etc. The overall aim of this project is to develop methods for storing and visualizing (in e.g. animations) geographic information with different time representations. This tool is crucial to a wide range of applications within social science and medicine in particular. A specific aim is to develop methods for making historic demographic information more accessible and easier to analyze (e.g. visually). There is a web map service created for the linked demographic and geographic data. A first version of this service will be public in 2012. This map service contains 50 digitalized historical maps, soil data from Svenska Geologiska Undersökningar (SGU), topographic data from Lantmäteriet and commercial sources, etc. Since it is based on standardized interfaces and standardized coordinate systems it can technically include all web map services that will be set up as part of the upcoming European spatial data infrastructure. A limitation with the current connection between the demographic data and the geographic data is that it is only made on aggregated level (in terms of persons). To improve the connection we would like to make the connection on individual level (that each person in SEDD is linked to one or several buildings or property units). However, this linkage requires methodological development since the two sources use different time representation. The historical maps can be regarded as snapshots of the conditions at a certain time while the demographic database is using object lifelines (a person exists from birth to death).